Cavity: a carious lesion or hole in a tooth. Caries: an infectious disease with progressive destruction of tooth substance, beginning on the enamel surface by demineralization of enamel or exposed cementum. Dental Decay: see dental caries (which means decay is the same phenomenon as caries). Photo on left is a patient with an actual cavity. She resides in Milford, CT. Photo on right is an example of dental caries but without an actual hole or cavity in the tooth. This patient was from New Haven, CT. Photos by Dr. Nicholas Calcaterra. The two photographs above show the clear distinction between a tooth with an actual hole in the tooth (hence the term cavity) vs. a tooth with decay but no hole… at least not yet! 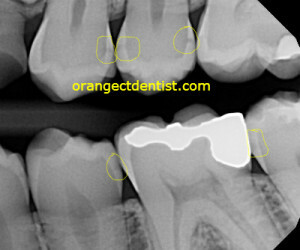 We know the tooth on the right has decay because of the color change and the digital x-ray showed it. Dental decay or caries is actually an infectious disease caused by specific bacteria. But just having the bacteria present in your mouth does NOT mean you will develop decay. Other factors must be present. X-ray of a patient with caries. The yellow circles show the formation of decay. This patient was from Woodbridge, CT.
What are those other factors? The most important other factor is sugar. The bacteria that cause tooth decay have an ideal diet of simple sugars. When you ingest a meal with lots of simple sugars (this includes candy and sugary sweets, but also food with large amounts of sucrose), the bacteria consume those sugars. Upon consumption of those sugars, they release acid. That acid goes on to attack the teeth and weaken them. Over time, the hard enamel shell of the tooth is dissolved. The tooth begins to dissolve. However, dissolution of the tooth does not always result in an actual hole forming in the tooth. This is seen in the photo above. We have seen many patients with decay going into the nerve of a tooth without any cavitation occurring. When decay goes into the nerve of the tooth, the patient will need a root canal procedure. There are numerous other factors which include: daily brushing and flossing habits, whether the patient had systemic fluoride intake as a child, topical application of fluoride, genetic factors which influence the strength of the teeth, medical conditions and diet during tooth development, rate of salivary flow, and numerous other factors. Identification of the factor(s) that caused the tooth decay to begin with and the subsequent elimination or reduction of those factors.